It only takes one great experience to fall in love with scuba diving. By owing your own gear you are more likely to enjoy the experience. It's a good idea to get your own mask, snorkel, fins, boots, gloves and hood from both a comfort and hygiene point of view. After-all who wants to use a snorkel that's been in someone else's mouth? It's a fantastic starter package designed to suit all adults. The Ocean Design Glide Open Heel Fins are great for diving and snorkelling. An excellent choice for divers entering the sport, the fins are easy to kick. The blade is designed to quickly reach the optimal angle needed to move water quickly and efficiently. The Apollo Edge Pro Dive Boots are an innovative 5 mm neoprene boot deigned to be used with open heel fins. The angled foot bed design matches the contour of your leg for less stress while fining, plus provides superior fit and comfort. This makes these boots ideal for diving. This is our top selling dive boot. Why? Because the hard sole provides plenty of extra protection for your feet when your dive entry is more demanding than a sandy beach or dive boat deck. Plus they are great value for money. 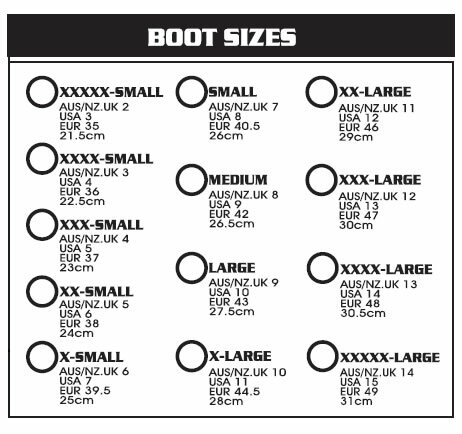 Boot sizes: The sizing chart from Apollo below indicates they have sizes 2 to 14 in these boots. But only sizes 3 to 14 are actually available in Australia. The special features of the Apollo Proflex Dive Gloves add extra warmth. The 3 mm Apollo Edge Semi-Dry Diving Hood features a short skirt to mate with drysuit and semi-dry wetsuit neck seals.